Three sisters. A magical castle. And a legend as old as Ireland. The day the Doyle sisters are attacked by a monster on the foggy shores of the Atlantic, they’re saved by a mysterious boy who stumbles out of the waves. That’s the first sign that nothing in their small world will ever be the same again. Striking, vain Bríd, caring but brusque Moira, and sweet, silent Ríona invite their injured savior into the crumbling castle they call home, only to find he’s prepared to challenge everything they think they know… About themselves. About their family. About their upbringing here on the edge of the world. And about the magic that permeates the castle. For the girls are keeping secrets of their own. When a second attack takes them all by surprise, they’ll have to decide what to believe, what to reveal, and just how to stay alive. Will the old walls of the castle be enough to keep the Doyle sisters safe, or will they be forced to flee? 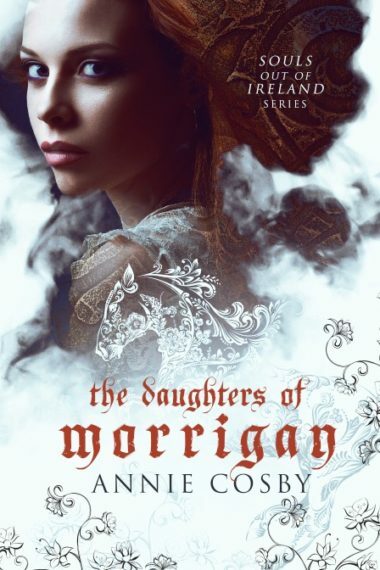 The Daughters of Morrigan is the first in a contemporary YA fantasy series steeped in Irish legend. If you like a sweeping setting and characters to fall for, you’ll love the first installment in Annie Cosby’s haunting new series, Souls Out of Ireland.